Located on the east side of Tulsa in the Catoosa, OK area, we are conveniently located just off of I-44 across the highway from the Hard Rock Casino, and just minutes from the Tulsa International Airport.We are located outside of the current construction projects on the I-244 corridor that leads into downtown Tulsa. We are just minutes from various businesses, Port of Catoosa, Mid America and attractions including the Blue Whale, Route 66, BOK Financial Corp., the University of Tulsa, Tulsa Raceway Park and Will Rogers Museum. 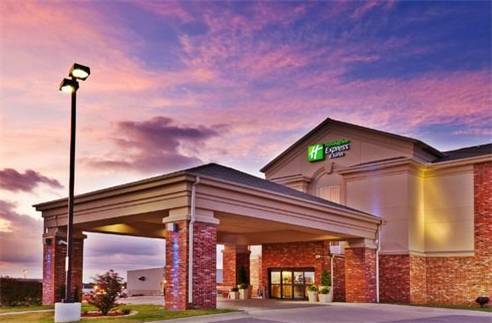 Whether it is business or pleasure that brings you to Tulsa and Catoosa, our hotel is designed to meet your needs. We are a 100% non smoking hotel...Visitors can connect to the free high-speed Internet access, swim a few laps in our outdoor seasonal pool and stay in shape in our Fitness Center that is open to our guest 24 hours. We invite you to wake up to our complimentary Express Start breakfast with yummy hot and cold breakfast items to fit your taste buds. Enjoy your stay with us! Molly's Landing is a fine dining restaurant in a rustic setting. There are seafood items, steak items and surf and turf combination plates that are scrumptious. The meeting room is 740 square feet of unobstructed views. The room can be set up to your needs. Coffee and Water are complimentary. There is a projection screen and a white board built in. A complimentary TV and DVD is available for your needs. Located next to the Hard Rock Casino. Only three minutes from our hotel.The golf course is an18 hole golf course-open to the public. The hours start at 7:00 a.m. Bring your family or golf buddies and enjoya wonderful golf weekend here in Catoosa! Lafortune Park is located 15 miles from the hotel. This 9 hole golf course is open to the public. Course opens at 7:00 a.m. after the golfing enjoy a dip in Lafortunes swimming pool or enjoy a walk around their mile long walking trail. Across the highway from us. The casino is open 24/ 7 with wonderful restaurants, entertainment and live music. A new event center opened on September 30, 2010. Come see great concerts. Make it a fun weekend with a variety of things to do! America's most beloved humorist. His museum's least savory exhibit. Bonus: Rub the statue's shoes for good luck. Ten titanic Christian digits reach heavenward at the entrance to Oral Roberts University. World's largest privately owned gun collection; if laid end-to-end the firearms would stretch over a mile. See the guns of Bonnie and Clyde and Pretty Boy Floyd. Bonus: execution nooses! A World War II sub that sank three Nazi subs plus 11 other vessels. 312 feet long. On dry land!